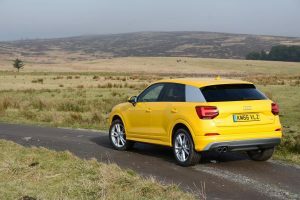 The Audi Q2‘s styling is more individual than its bigger Audi SUV brothers, yet it offers typical levels of Audi refinement and interior quality, along with reasonable efficiency, but is the driving experience as interesting as its design? Audi, like other premium manufacturers, has been doing well from its SUV sales, but until now the Q3 has been the least expensive SUV offering from the brand. 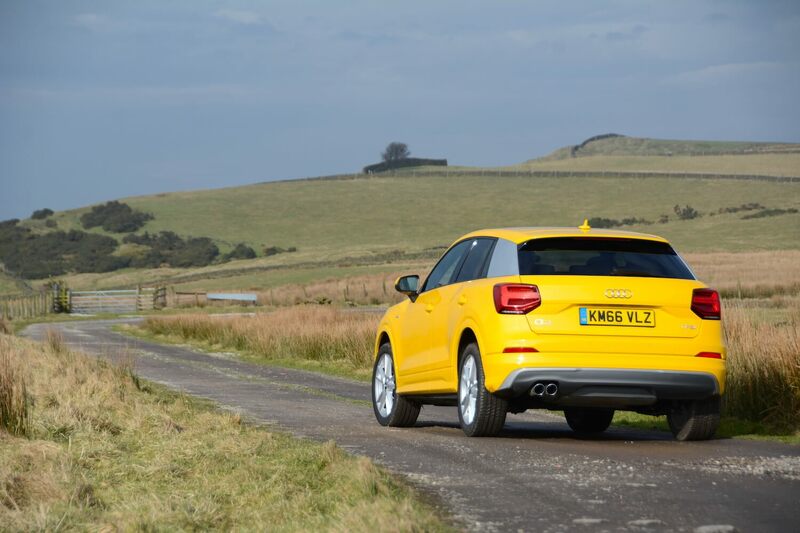 However you can now get behind the wheel of a smaller and more affordable SUV in the form of the Q2. 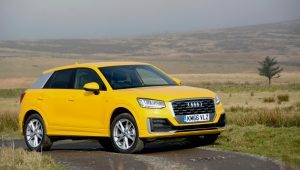 The Audi Q2 is more visually interesting than its bigger SUV brothers (although it’s still somewhat restrained for a small SUV) and it’s the closest that Audi has come to the implementing the design of the Audi Steppenwolf concept car, which first appeared way back in 2000 – even though the wide arches and the huge wheels of the Steppenwolf have given way to a production car with less of a monster truck stance. One of the most distinguishing features of the Q2 is the rear C-pillar, which features a ‘blade’ that can be specified in different colours. So it looks interesting on the outside – even though the ‘Vegas yellow’ colour of our test car certainly wouldn’t be our choice – and the interior is a very pleasant, well-designed environment, with a high quality feel that has been synonymous with Audis over recent years. 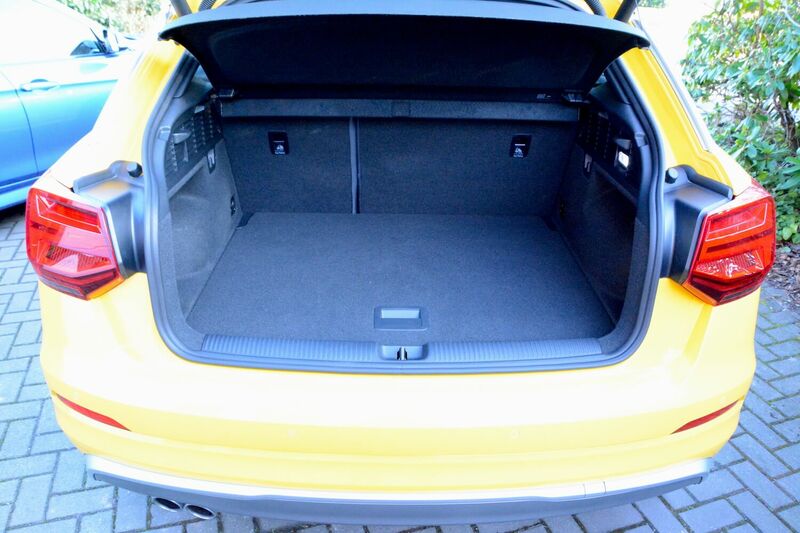 There’s not a huge amount of space in the rear seats, or in the boot. For a car that’s likely to be bought as family transport, it’s worth noting that a mountain buggy that fitted in the boot of the last MINI Countryman (and the new Countryman is bigger) wouldn’t fit in the boot of the Q2. Under the bonnet of our test car was the 1.4 TFSI Cylinder on Demand 150 PS petrol engine, with a 7-speed S tronic dual-clutch transmission, along with front-wheel drive. First things first, the driving position may suit some people, but in our view, with the seat in a low position, there’s too much gap between the seat and the lowest position of the steering wheel. This is typical of many small SUVs, but it’s just not for us. So we could never get an ideal driving position during our time with the Q2. When you get going, if you need to nip into gaps in traffic from a side road, there’s often a very slight delay between depressing the accelerator and the car responding, but when it does respond, there’s a sudden delivery of power to the front wheels. If you’re turning out of a junction on a cold, wet road, then wheelspin can all too easily result – such issues with low levels of grip aren’t really what you want from a car that thinks it’s an SUV. 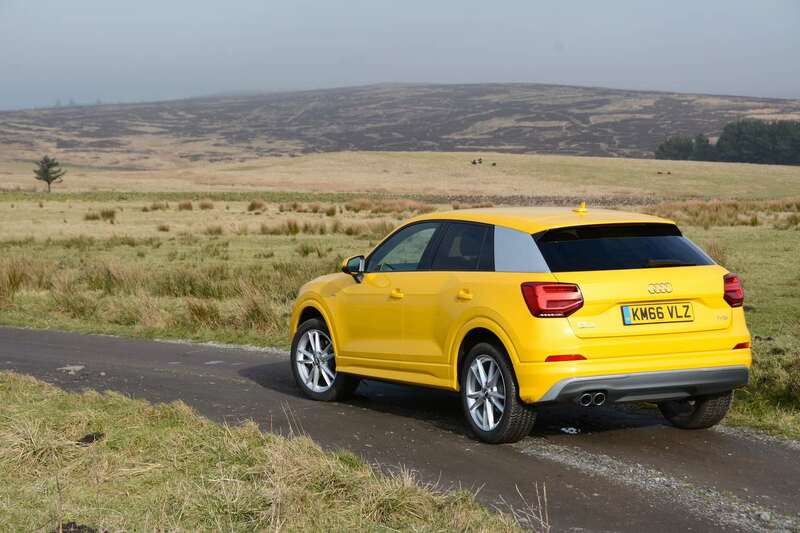 Q2 models with top of the range petrol and diesel engines are available with quattro four-wheel drive, which would provide a solution to the issue of limited grip. Once you’re under way, life in the Q2 is generally very acceptable. The 1.4 TFSI petrol engine is quiet and responsive under normal driving, and the whole car offers typical levels of Audi refinement. 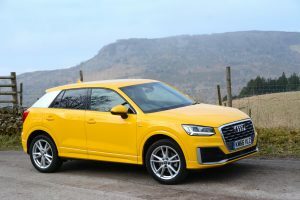 The car feels efficient, and this is helped by being relatively lightweight; the Audi Q2 with the smaller 1-litre, three-cylinder TFSI engine weighs just 1,205 kg. Our S line test car had a steering wheel that worked well from both a visual and tactile point of view, but ultimately the steering doesn’t have much feeling or sharpness to it. 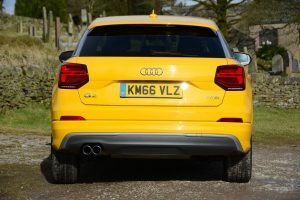 Despite being relatively light, the Q2’s handling is best described as competent rather than rewarding, and as is typically the case with SUVs in this class, the suspension has to be fairly firm to keep body roll in check, so although the ride is fine on smooth roads, it’s certainly not that cosseting on poor surfaces. The (optional) Audi drive select system provides five modes: auto, comfort, dynamic, efficiency and individual. Throttle response becomes sharper in dynamic mode, and efficiency is probably the most eco-minded mode for long motorway journeys, but ultimately there’s not a huge difference between the settings. The 7-speed S tronic dual-clutch transmission also has the options of Drive or Sport, and there are steering wheel-mounted gear-shift paddles. 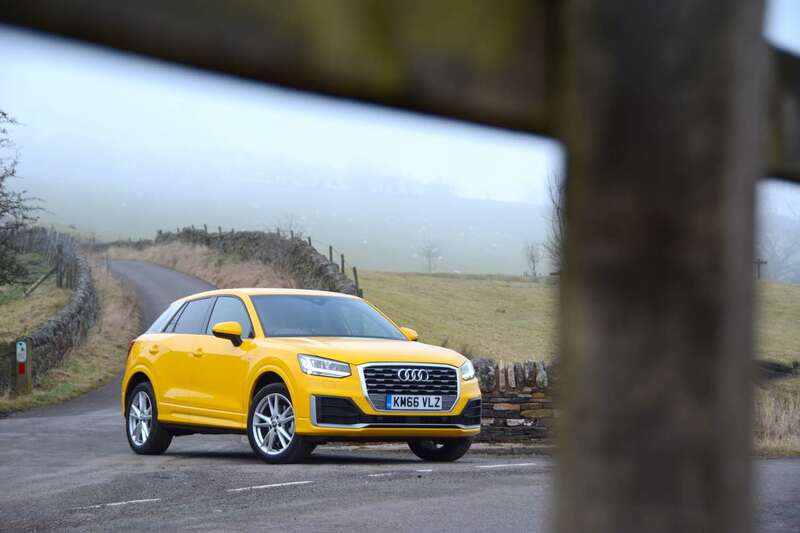 The Q2 with this engine and transmission combination is perfectly capable under normal driving, but it does feel out of its comfort zone if you need to press on, and there isn’t sufficient reward from the driving experience to describe it as a driver’s car. What Audi is very good at, however, is making the driver feel special with interior ambience and technology. 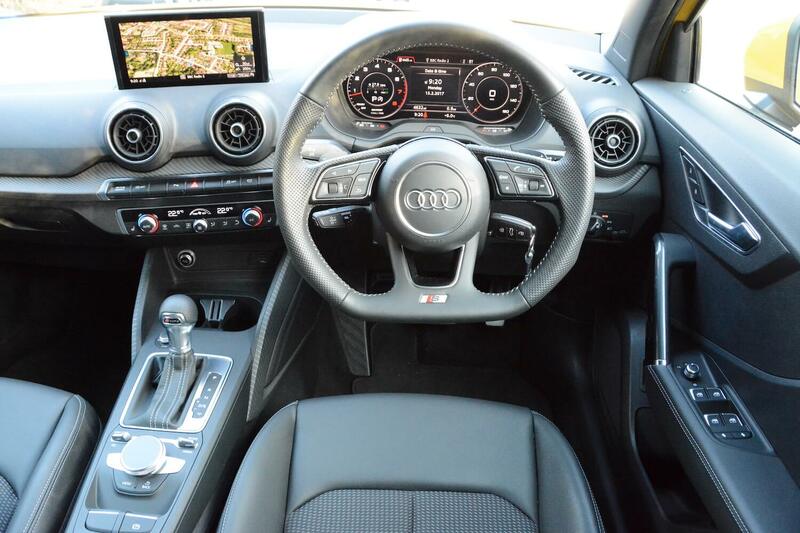 The Q2 has a wide central screen, and you can also show information such as the satnav map between the dials in the instrument cluster in front of the driver (Audi’s ‘virtual cockpit’). And thankfully you don’t have to wrestle with attempting to touch small buttons on a screen to control car functions when you’re driving as there’s a rotary controller and buttons for key menus near the gear selector. The official combined fuel economy of the Audi Q2 1.4 TFSI is 54.3 mpg, equating to 123 g/km CO2. Our test car returned an indicated 47.5mpg at 70mph on the motorway, however overall after week of mixed driving it averaged 42.1mpg – which is respectable for a petrol SUV, albeit a small one, and petrol engines are cleaner than diesels in terms of emissions that impact on local air quality. The 1.4 TFSI engine also has a ‘Cylinder on Demand’ feature which means that it can switch off two cylinders when they’re not needed, so saving fuel. 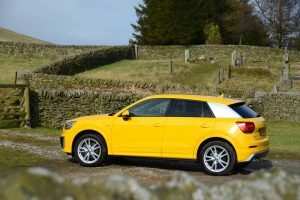 With a Cd value of 0.30, the Q2 is relatively aerodynamic for an SUV, but the fact remains that SUVs, which are currently in demand all over the world, don’t have aerodynamics that are as slippery as a saloon or hatchback (or even an estate), so if you really do want a car that’s efficient in real-life driving, then don’t choose an SUV. 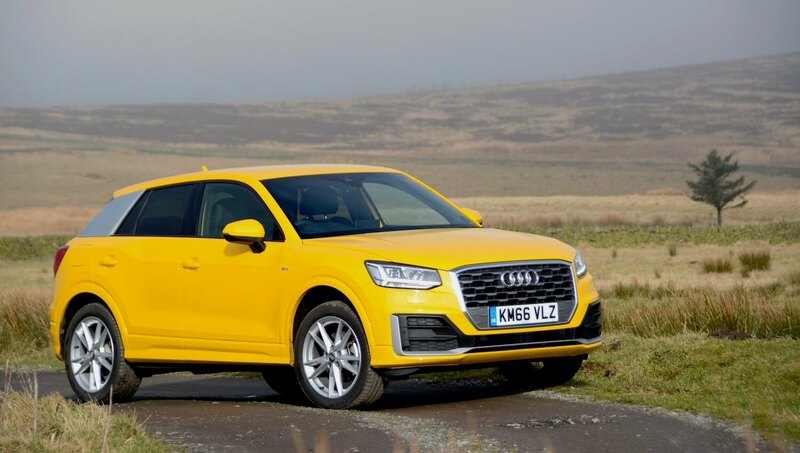 Prices for the Audi Q2 start from £20,230 for the 1.0-litre TFSI in SE trim level, although our Q2 1.4 TFSI Cylinder on Demand 150 PS S line S tronic test car cost £27,515. However, as is usually the case with Audis, our test car had a number of options, including that delightful Vegas Yellow paint finish (£550), technology pack (£1,595), comfort pack (£900), power operated boot lid (£450), active lane assist pack (£425), adaptive cruise control (£375), privacy glass £375, Audi parking system plus (£300), and more… all bringing the total price of the test car to £34,475. Despite this price, you still have to put the key in the ignition to start it, which seems very old-fashioned these days. Three petrol TFSI and three diesel TDI engines are available: 1.0 TFSI (116 hp), 1.4 TFSI (150 hp), 2.0 TFSI (190 hp); 1.6 TDI (116 hp), 2.0 TDI (150 hp), 2.0 TDI (190 hp). The seven-speed S tronic is optional, with a six-speed manual transmission standard. Quattro all-wheel drive comes as standard with the top petrol engine and top (190 hp) TDI engine, and is optional in the 2.0 TDI with 150 hp. 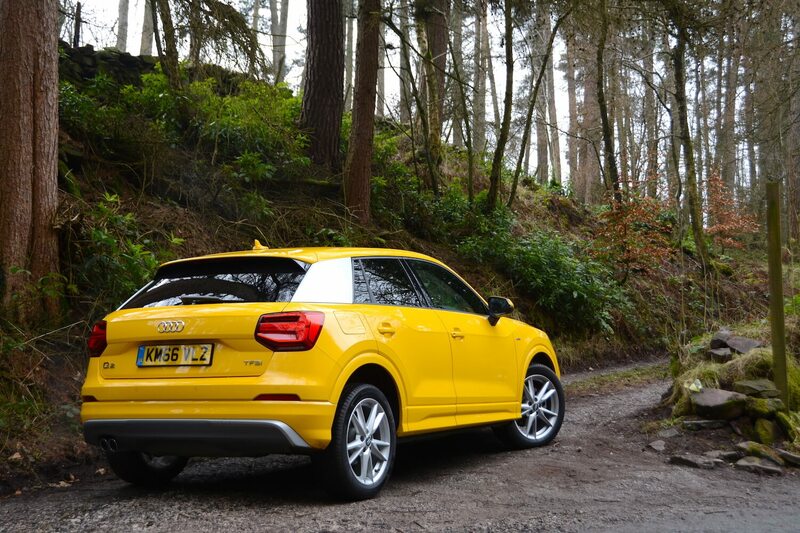 The Q2 is available in 3 trim levels – SE, Sport, S line – and for a limited time, Edition #1. 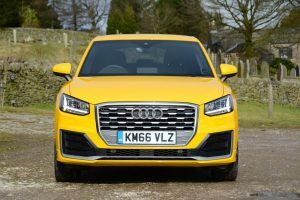 The Audi Q2 is certainly a desirable small SUV. It provides a feel-good factor for the driver thanks to its interior ambience, and the exterior is more visually interesting than its bigger Audi SUV stablemates. The 1.4 TFSI engine is responsive, efficient, refined and quiet. 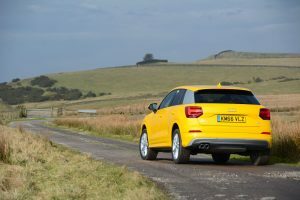 The everyday driving experience ticks lots of boxes, but in front-wheel drive 1.4 TFSI guise at least, the Q2 is not a rewarding driver’s car – although that will probably be fine for most buyers. However at £27,515, before any options are ticked, the Q2 can’t be described as cheap; it’s just a shame that you’ll probably have to go for the top of the range 190 hp petrol 2.0 TFSI with quattro four-wheel drive to make the most of the Q2; you’ll be looking at around £35,000 for this model, and it’s not as efficient as the 1.4 TFSI. 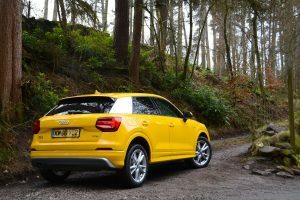 So all in all, the Q2 is a competent Audi despite not being as exciting to drive as its looks may suggest; it gains a Green Car Guide rating of 8 out of 10.